This is just a quick note to say that Your Critic's brain has melted. Or at least, that it's about to. We will be out of town or otherwise unavailable for roughly a week, in transit on Friday and on Monday, and this trip coincides nicely with my need for a few days away from writing. Thus, we'll be on hold for roughly a week over here; you can expect the next post on Wednesday, June 29. I can moderate comments fairly easily on the road so feel free to carry on relevant discussions while I'm away. If I can, I'll get part 2 of the Gamer's Gaze up this afternoon or evening, but in the midst of packing and preparing for a buttcrack-of-dawn flight some things don't happen. If I don't, it'll be first up when we're back. Meanwhile, enjoy your summer. (Or, for the surprising number of my Australian readers, your winter.) I shall be eating too much, drinking too much, and making just the right amount of merry this weekend. When I get back, I'll be discussing my opinions on Enslaved: Odyssey to the West, finally starting L.A. Noire, and wondering just how the Fallout: New Vegas DLC could be so story-great and gameplay-poor. Also when I get back, I'll be starting to post occasionally at GameCritics.com, which should be fun for us all I hope! 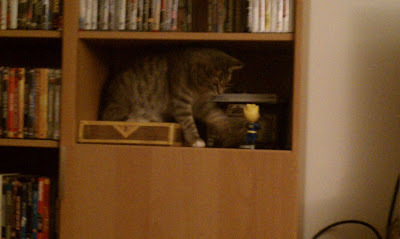 In conclusion, Guybrush the cat likes Fallout 3 as much as I do, and bobbleheads rather a lot more. 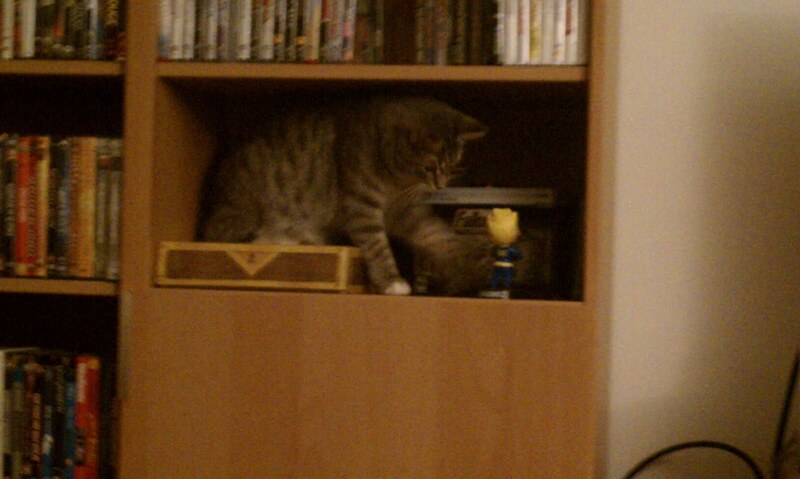 I freaking hate bobbleheads. But the lunchbox is cool. So an admin post is probably the best place to ask this random question. How come you don't include any post content in your RSS feed? Is that a preference or just a default setting? If it's the latter then c'mon, show us some love! Do you have some bottlecaps? You could make a bomb out of the lunchbox and blow up the bobblehead. I am jealous of everyone who's getting to play L.A. Noire, just as I am of everyone who's played Heavy Rain and RDR. Sigh. I'd heard that, but I'd also heard of a RDR port that never seems to have materialized. Wishin' and hopin'. This is apropos of nothing really, other than that I think its neat but: Has anyone mentioned here that Dominic Armato is, and has been for many years, a pretty serious food blogger? I just find that kind of awesome, and have been meaning to mention it since you named your cat. I'd been reading his food blog for a couple of years when TellTale did their MI sequels, and discovering he was also the voice of Guybrush. (Its at www.skilletdoux.com, for those interested). I'm convinced that cats with striped, earth tone fur are smartest and make the best companions. Probably because they aren't inbred. Too smart. Yesterday he figured out how to control the switch for the living room's ceiling fan. A research study found that cats do not comprehend cause and effect. The first thing I thought was that the researchers assumed all cats have equal intelligence. I mean Guybrush or my feline co-conspirator vs the average Persian (cat) is no contest, and both disprove study results.